Béchamel sauce is the key to great lasagnas, soufflés and much more—and it's simple to make at home. Béchamel is one of the mother sauces in classic French cooking, and one of the most important sauces to learn for all sorts of dishes, French and otherwise. It's a key ingredient in soufflé, a classic Bolognese lasagna, and even old-school mac and cheese. And it's incredibly easy to make. Here's how. Cooking the flour and butter together first helps remove the flour's raw flavor, and prevents lumps from forming later. A ratio of 1 1/2 tablespoons each of flour and butter per cup of milk makes a thickened yet still pourable sauce, great for all sorts of recipes. In a small saucepan, melt butter over medium-high heat (do not allow it to brown). Add flour and whisk to form a paste. Continue to cook, stirring, until raw flour scent is gone, about 1 minute. Whisking constantly, add milk in a thin, steady stream, or in increments of a couple of tablespoons at a time, whisking thoroughly and getting into all corners of the pan to maintain a homogeneous texture. Sauce will initially become very thick, then get very thin once all the milk is added. Heat, stirring, until sauce comes to a simmer and begins to thicken slightly. Reduce heat to low and cook, stirring, until sauce is thick enough to coat the back of a wooden spoon, about 3 minutes. Season with salt and pepper. Add nutmeg to taste, if using. 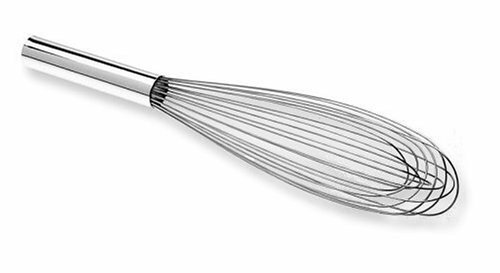 If any lumps form, simply whisk thoroughly to remove them and smooth out sauce, or use a hand blender or countertop blender if lumps are particularly large or tough. Use sauce right away, or press a piece of plastic wrap over surface of sauce to prevent a skin from forming and keep warm until ready to use. Sauce can be cooled and stored in a sealed container in the refrigerator for several days. Reheat very gently on the stovetop or in a microwave to use. This recipe uses a ratio of 1 1/2 tablespoons each of flour and butter per cup of milk, producing a sauce that's luxuriously silky and thick, but still quite pourable—it will work well in a variety of dishes. Depending on the recipe and your personal preference, you can make a thinner béchamel by reducing the flour and butter to 1 tablespoon each per cup of milk, or a very thick one (say, for a soufflé base or Greek moussaka) by increasing them to 3 tablespoons each per cup of milk. You can easily scale this recipe up or down as desired.